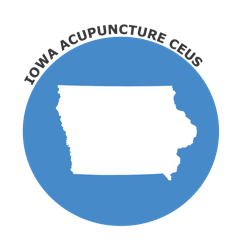 ACE is proud to offer Acupuncture CEU/PDA courses for Iowa Acupuncturists seeking to renew their license. Stay on top of your Acupuncture CE requirements and further your professional skills with ACE. Choose from a variety of different online courses pertaining to Acupuncture, TCM/Oriental Medicine, Herbs, Ethics, and Bio-Medicine subjects. We strive to make obtaining acupuncture CE online a seamless process, which is why you receive your certificate of completion immediately after passing the course. The state of Iowa requires NCCAOM Certification for acupuncture license renewal. Browse Approved NCCAOM PDA or CEU Courses. After an acupuncture license is issued, the license expires on October 31 of even years. Renewal applications must include the correct renewal fee, along with documented evidence that the licensee holds current active status as a diplomate in acupuncture or oriental medicine from the NCCAOM. Physicians, Chiropractors, Dentists, and Podiatrists are licensees that are not required to obtain an acupuncture license. Instead, these health care providers may practice acupuncture under their Iowa professional license according to IAC 653-17.2(148E). For more information on this subject, please visit the Iowa State Board’s website. Please review the following paragraph to stay current on Iowa state laws and rules pertaining to the practice of acupuncture. An acupuncturist shall display the license issued pursuant to section 148E.2 in a conspicuous place in the acupuncturist’s place of business. Pursuant to Iowa Code section 148E.6, acupuncturists must provide a disclosure sheet to each patient upon initial contact. The disclosure sheet must be signed and dated by the patient and retained for at least 5 years after cessation of the treatment. The following information must be contained on the written form. (1) The name, business address, and business telephone number of the acupuncturist. (3) A listing of the acupuncturist’s education, experience, degrees, certificates, or credentials related to acupuncture awarded by professional acupuncture organizations, the length of time required to obtain the degrees or credentials, and experience. (4) A statement indicating any license, certificate, or registration in a health care occupation which was revoked by any local, state, or national health care agency. (5) A statement that the acupuncturist is complying with statutes and rules adopted by the board, including a statement that only pre-sterilized, disposable needles are used by the acupuncturist. (6) A statement indicating that the practice of acupuncture is regulated by the board. (7) A statement indicating that a license to practice acupuncture does not authorize a person to practice medicine and surgery in this state, and that the services of an acupuncturist must not be regarded as diagnosis and treatment by a person licensed to practice medicine and must not be regarded as medical opinion or advice. For more information and details, please visit the Iowa Acupuncture Board’s website.